The John Glenn Research Center in Cleveland, Ohio is one of NASA’s well known operating locations. As the U.S. government’s space and aviation agency, NASA does not like leaking roofs. Especially when they are protecting critical research equipment, labs, and materials. 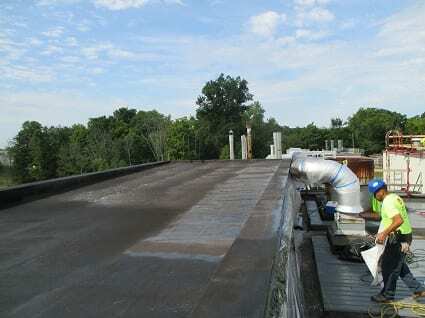 One of the laboratory roofs at this base was torn-off, due to complete saturation of the existing insulation, and replaced with our TRITOflex roofing system. An independent, respected roof consulting firm recommended NASA go with a liquid-applied, instant-setting membrane rather than a traditional rolled or sheet good because of the high number of penetrations and flashing requirements on this roof. A factory-manufactured membrane would not only mean a higher cost, but one more prone to leaks and maintenance with reliance on termination bars, bands, caulk, etc. The seamless, monolithic TRITOflex membrane was spray-applied to an 80 mil (2 mm) dry thickness, in one coat over the self-adhering bitumen base sheet, with a 20 mil (0.5 mm) TRITOtherm ceramic top coat. 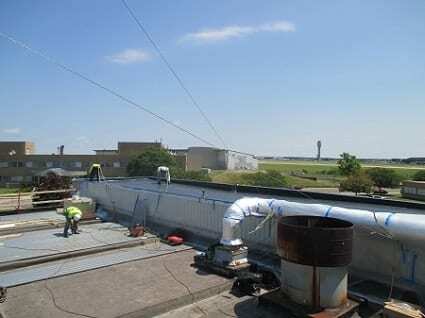 The new roof, which is warrantied to withstand extreme winds and hail for 20 years, was installed by a Certified Triton Applicator.NASA has joined the long list of clients who are happy and satisfied with a new leak-free, low-maintenance Triton roof system. After seeing how our roofs compare to roofs on all their other buildings, the TRITOflex system has become a common sense, eco-smart alternative for additional buildings at the center. For use on a different project, NASA actually tested our TRITOflex material in one of their labs. They exposed the membrane to temperatures in excess of 300 degrees F (148 C) and it passed all of their tests with flying colors!